1941 was not a good year for the German naval supply capacity in the Mediterranean, with many of the vessels that were present at the start of operations in North Africa in February being lost by the end of the year. The tonnage losses amounted to about 70,000 tons lost out of 124,000 tons available at the start of the year, or 57%. In reaction to this, and the continuing need to supply German forces in North Africa, an emergency construction programme was established, based on a standardised type of a relatively small steamship of easy construction, called a Kriegstransporter abbreviated KT (literally: war transport). This was in addition to the considerable programme of Marinefaehrpraehme abbreviated MFP (literally: Navy Ferry Barge – called ‘F-Lighters’ by the Royal Navy). 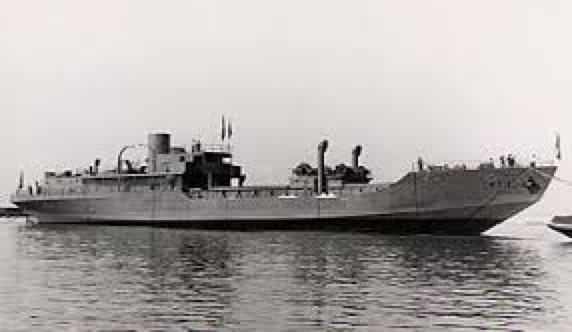 Unlike the flat-bottomed MFP, the KT were proper ships with about five times the displacement (1,200 tons fully loaded (I guess) instead of up to 220 tons for version A of the MFP), higher speed (14.5 knots instead of 10.3 knots), and about four times the carrying capacity (400 tons instead of up to 105 tons for Type A of the MFP). They also had the advantage of running on coal, rather than scarce Diesel or fuel oil, and had considerably more range and were more seaworthy (one of the first MFPs in the Mediterranean sank on its maiden voyage due to constructive weakness). Just like the MFP, the KT were not given names, but were simply numbered, starting with KT1 (KT3 was the type ship, and the only one constructed in Germany). The KT could take as many tanks as the MFP in one load, six, and they had the ability to unload these themselves in harbour, through the use of a 30t crane that was installed amidships. This was sufficient to handle any tank then in the German or Italian arsenal. The programme was discussed in January 1942 at the naval transport section in Naples, and the entry into its war diary is given below. Despite the ambitious timeline, only two vessels were commissioned before the end of 1942, in other words the programme failed to achieve its ultimate aim, to alleviate the shortage of merchant tonnage on the North Africa route in 1942. Another meeting was held at the Italian naval ministry in Rome on 27 January, with high-level representatives from the four shipyards designated to carry out the programme, and the Italian naval ministry. The conclusion of this was a programme that foresaw materials being delivered from February to May 1942, and for five steamers to be ready by the end of September 1942, with another two coming in October and November each, and another four in December, for a total of 12 being ready by the end of the year, and the remaining eight to be finished by the end of August 1943. This meeting was followed by another meeting during the morning of 28 January in the Naval Ministry, at which the German side was informed by the Italian navy that because of an intervention by the Italian Minister for Transport, the programme had to be halved, because it otherwise threatened the Italian construction programme. The new programme foresaw five steamers to be ready in September, with the remainder coming in the fourth quarter of 1942. In the end however it was to take to 3 February 1943 to reach four completed KT from Italian yards. Construction continued until the end of the war, when 40 of the KT had been completed on Italian yards, and another two in a French yard. 30 KT were launched by Ansaldo Genoa alone by the end of the war. There is a very informative thread including many pictures at this link.